Dr. Chitra Venkateswaran (MD Psychiatry) is the Founder and Clinical Director of the Mehac Foundation, a not-for-profit organization that works towards improving the quality of lives of mentally ill people and their families in Kerala, and throughout India, by incorporating the principles of palliative care. The foundation strives to deliver exceptional care focusing on strengthening mental health services and access to medications in the community, and improving quality of care. Dr. Venkateswaran a senior faculty in Psychiatry devotes her time to palliative care issues especially psychosocial issues, training and research. She has focused on identifying psychological distress in the palliative care population as part of her research and has carried out projects both in India and the UK. As a Union for International Cancer Control (UICC) International Research Fellow (2006-2008), she did research on screening tools for psychological distress in palliative care in Leeds, UK. She initiated psycho oncology clinics in the Pain and Palliative Care Society, Calicut, (2003) and in the Amrita Institute of Medical Sciences (2008). 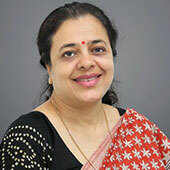 Alongside her research work, Dr. Venkateswaran is a member of the National Faculty in Palliative Care in India, the Indian Association of Palliative Care and Faculty/Consultant for Cairdeas International Palliative Care Trust, Scotland, UK. She is a also a member of the Psycho Social Advisory Panel, Palcare-The Jimmy S Bilimoria Foundation, member of Wabi Sabi Health Foundation, USA and is a Honorary Senior Research Fellow of Hull Medical School, UK. She contributed to the ‘Palliative Care Toolkit’ published by the Worldwide Hospice Palliative Care Alliance, which is now available in several languages. She also holds a Diploma in Leadership from the International Palliative Care Leadership Development Initiative (2012-2013). Dr. Venkateswaran joined the IAHPC Board of Directors in 2016. Outside of palliative care, she enjoys reading, music and singing. Her husband is a leading media professional working with The Hindu publication, based in New Delhi. Her daughter is completed her Master’s in Archaeology at Oxford University, UK, and is an exponent of the classical Indian dance form, Mohiniyattam.